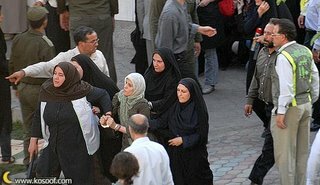 Once again Iranian women challenged the Islamo-Fascists, and once again the intolerant clerics could not tolerate a peaceful gathering. Look at the pictures, this is the confrontation of good against evil, progress against reincarnated figures from the Dark Ages. "We are women, we are human, but we don't have any rights!" protesters chanted. - Elimination of temporary work contracts which disproportionately and negatively impact women. Yet Elaheh Rostami, a lecturer at SOAS and a promoter of the Islamic regime, claims "Iranian women have more rights now than before the revolution" How could the British universities have sunk to such a low level to employ such idiots as lecturers? "The viciousness of the police attack caused men who were passing by in the street to protest, our correspondent says. These are our sisters, how can you do this?" passers-by shouted at police. The women then gathered again on the other side of the square, but the police used pepper spray against them and onlookers. As the police started making arrests members of the public who had nothing to do with the protest repeatedly shouted: "Leave them alone." One man screamed at the police, saying: "Why do you take money from the government to beat women like this?" Feminists of Europe, have some shame! 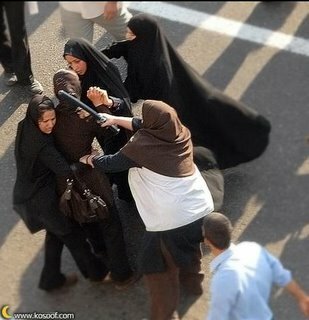 These are your sisters being beaten up. They want the same rights as you. Why do you think Iranian women are not worthy of your support?????? The BBC has assumed the role of the Islamic Republic Broadcasting Corporation! They report that only 20 people showed up!!! This make my blood boil!!!! This is the very same BBC who gave a podium for the terrorist of the century Ayatollah Khomeini to launch his Islamic takeover of Iran!!! Believe me when I say that under every mullah's beard it says "Made in the U.K."!!! BASTARDS report the truth! 20 people!!!!!!!!!!!!!! Multiply that by a thousand and you'll be nearer the truthful figure! Azarmehr-jaan, see my blog for more links/pics and an audio clip. IRANIANS IN PARIS AND FREEDOM LOVING PEOPLE OF THE WORLD PLEASE SUPPORT THESE IRANIANS! "Feminists of Europe, have some shame! 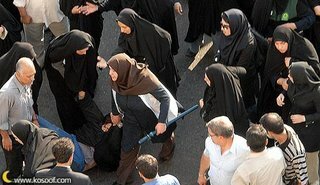 These are your sisters being beaten up. They want the same rights as you. Why do you think Iranian women are not worthy of your support??????" That question goes for feminists all over the globe. The silence IS deafening. Women in Europe are too busy defending womens rights to SUBMIT to religeon (Cherie Blair) which doesnt help. I grew up with feminism, but have been disgusted by the people who call themselves feminists. Mostly, they hail from the Left and their campaigns are purely political. I hear a lot of complaints about American Conservative Christians, but nothing about this. Feminism does not seem to me a movement to protect womens' rights, it is a poltiical wing of Socialism. Imagine if this had happened in Israel, every news paper, and every TV station in the country would have it leading the news, for days. Women seem only important if they can be used for political gain, by the British media and 'feminists'.